Every issue of the Golden Football Magazine contains an article on FSU football. 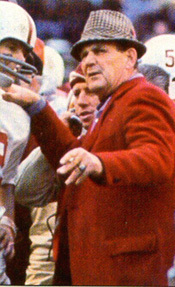 Alabama had allowed only 37 points in the entire 1966 season. Little did they know that, when the Tide hosted Florida State in their 1967 opener, the Seminoles would score that many in one game – and still not win! Coach Bill Peterson's Seminoles were decided underdogs after their 33-13 loss at Houston the week before. 1966 had produced a 6-5 record ending with a 28-20 loss to Wyoming in the Sun Bowl. The Tide, on the other hand, had run the table in 1966, 11-0. However, they finished #3 after the infamous Notre Dame-Mich­igan State "Game of the Century" tie. The Seminoles weren't intimidated by the largest crowd in their history, 71,299 in Legion Field, Birmingham. FSU jumped to a 14-0 lead on QB Kim Hammond's TD pass to WR Ron Sellers and DB Walt Sumner's 75y punt return. Stung, Alabama fought back behind QB Ken Stabler's TD run and 51-yard TD pass to WR Dennis Homan to take a 15-14 lead. Joe Kelley had started in place of Kenny because of the latter's off- season rules violations. However, the 'Noles kept moving the ball against Bear's vaunted defense, taking leads of 17-15 and then 24-22 at halftime. Whatever Bryant said to his boys at halftime didn't work because they couldn't put away the Noles. FSU extended its lead to 27-22 in Q3, during which they held Bama scoreless. A Tide TD and 2-point conversion and another FSU FG produced a 30-30 tie in Q4. HB Ed Morgan ran 3y for a TD set up by Stabler's 55y pass to Homan. But Hammond passed FSU 65y on a drive that culminated in an 8y TD to HB Bill Moreman. Peterson decided to kick the tying point that ended Alabama's 17-game winning streak. He said afterwards: I wasn't going to mess up 60 minutes of great effort by failing on a two-point try. 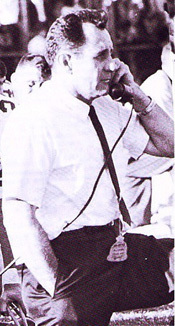 Hammond's 280 yards in aerials left Coach Bryant moaning about his pass defense (or lack thereof). The 37 points remain the most ever scored by the Crimson Tide in a tie game. This is the weakest defensive team I ever put on the field. They gave less effort than any team I ever put out there. But I'm being critical of myself. I didn't do my job well or they wouldn't have been that bad. We didn't lose the game tonight. We lost the game last spring and last week. I couldn't convince the defense they were pitiful. I couldn't convince you gentlemen of the press, either. Everything about the defense was poor. They've forgotten what it takes to play defense. But if I had contributed anything from the bench, we would have won the ballgame. Both teams had good seasons. Bama finished the season 8-2-1 with a loss to Texas A&M in the Cotton Bowl, Bear's first defeat at the hands of a former player (Gene Stallings). The Tide didn't give up more than 24 points in any game the rest of the way. They shut out two opponents and held four others to seven or fewer points. FSU won its last seven games (including its first ever victory in Gainesville) to finish 7-2-1 and earn a trip to the Gator Bowl, where they tied Penn State 17-17. "Our team cheated ... and we still couldn't beat him." Offside? OK, Do It Again. "The Most Bizarre of His Victories"
Birth of "Huff the Magic Dragon"
Can Anybody Here Snap the Ball? "The Zaniest Game in Miami's History"